Smarter Pool Heating? Solar is the Solution! After your pool is installed, you’ll want to get the most out of your investment as possible. This means more fun and relaxation, as well as keeping your ongoing costs down. With solar heating, you’ll extend your pool season by keeping it warmer longer and by being able to open your pool earlier in the spring and keep it open longer into the fall. Solar Pool Heating is Simple. The idea of heating water with solar energy is nothing new. Ever leave a garden hose laying in the sun for a while, then felt how hot the water came out? Solar thermal (heat) energy is what heated up the water. At any given moment there is a tremendous amount of solar thermal energy falling on the earth. And thank goodness, or else things would get pretty cold, pretty fast. Solar pool heating systems take that “garden hose theory,” and apply it in a design that harnesses the sun’s energy at a much higher efficiency. A solar pool panel (also referred to as a “solar collector”) is essentially a series of small tubes (called “risers”) through which pool water is passed at a relatively low speed. Using the pool’s existing filtration in most cases, water is pumped through the tubes of the panel, and heat is transferred from the collector to the pool water. The warm water flows back to the pool, and the cycle continues till the desired temperature is reached, or there is insufficient solar energy. Solar Pool Heating is Dependable. If you can believe it, early solar heater designs were constructed of copper! This, of course, did not react well with pool water. Today, all commercially available solar pool heaters are made out black plastic – the most popular of which is polypropylene (pol·y·pro·pyl·ene). Polypropylene is the material of choice for a number of reasons, such as resistance to corrosion and UV radiation. The battery case in your car is made from polypropylene, and power lines are jacketed with it. ECOSUN is made using a specially-formulated blend of polypropylene that has been pre-compounded with antioxidants to prevent UV degradation. By using pre-compounded plastic resin, we can ensure an even distribution of these antioxidants throughout the entire solar panel. This is where other manufacturers cut corners use a “salt-and-pepper” approach, mixing concentrated antioxidant resin pellets in with natural polypropylene pellets and relying on their manufacturing process to blend the two. The true benchmark for dependability is durability, and the highest standard for recreational aquatic equipment is the National Sanitation Foundation’s Standard 50 (NSF-50). ECOSUN is manufactured by Aquatherm Industries, Inc. – one of only two company’s in the world to have met the strict safety, durability, and toxicity criteria required to be listed NSF-50. Solar Pool Heating is Affordable. Heating a swimming pool takes an incredible amount of energy. Using gas or electric to heat your pool can add up to costly bills, but with a solar pool heating system, there are no recurring costs or monthly bills to worry about. Installing a solar heater has a comparable upfront cost to an electric heat pump, but without the monthly bills. 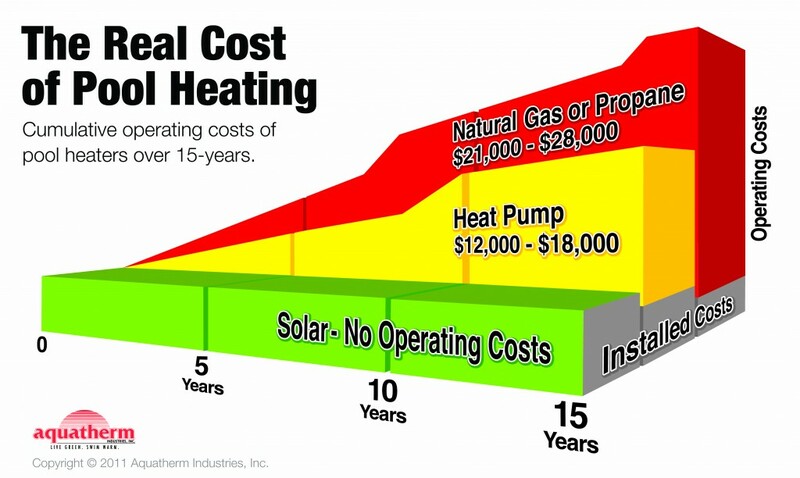 When compared to the cost of operating a fossil-fuel heater, a solar heating system can pay for itself in just a few short years. The chart above shows how the cost of heating a pool with gas or electric can add up over time. Notice there is a sudden jump in cost for electric heat pump, and two jumps for natural gas/propane – this is the cost of replacing the heater. 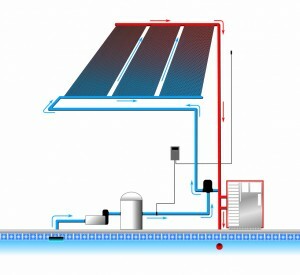 A quality solar pool heating system installed properly will easily perform for 15 years, however gas and electric heaters are complex machines with many parts and potential failure points.